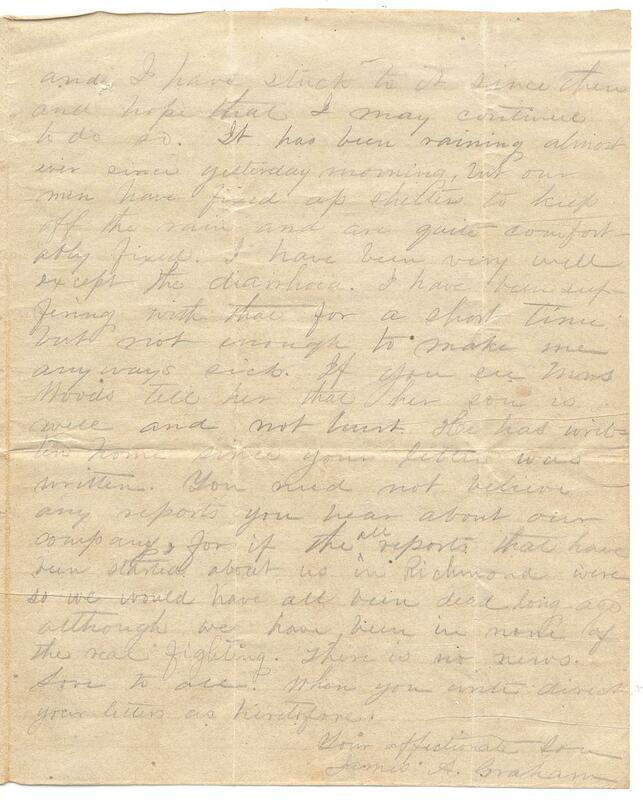 Item description: Letter, 11 July 1862, from James Augustus Graham, Company G (Orange Guards), 27th North Carolina Infantry Regiment, to his mother, Mrs. William Alexander Graham in Hillsborough, N.C. Graham wrote from camp in Prince George County, near Petersburg, Va., reporting on the near constant marching, the absence of injury in his company despite rumors to the contrary, his twenty-first birthday resolution to quit smoking and chewing tobacco, and a bout with diarrhea. 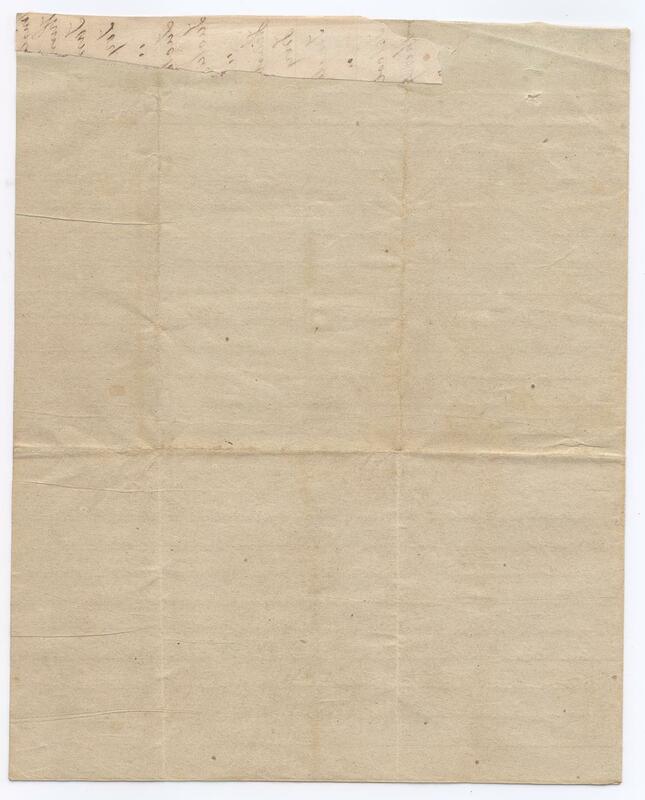 Item citation: from folder 1 in the James Augustus Graham Papers, #283, Southern Historical Collection, Wilson Library, University of North Carolina at Chapel Hill. I have just recieved your very welcome letter dated June 30th. 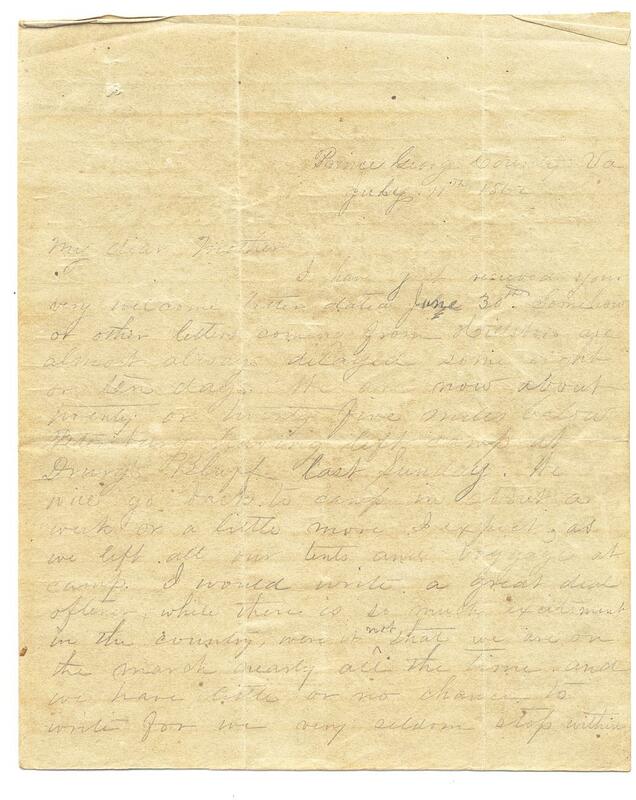 Somehow or other letters coming from Hillsboro are almost always delayed some eight or ten days. We are now about twenty or twenty five miles below Petersburg having left camp at Drury’s Bluff last Sunday. We will go back to camp in about a week or a little more I expect, as we left all our tents and baggage at camp. I would write a great deal oftener, while there is so much excitement in the country, were it not that we are on the march nearly all the time and we have little or no chance to write for we very seldom stop within reaching distance of a town or Post office. I will write as often as I can, but you need not be uneasy about me; for I will certainly write if I am wounded or have it arranged so that you can hear if anything worse befalls me. We have only been in one little brush and got one pretty good shelling from the yankee gunboats, but none of our men were hurt at all. If you hear anybody inquiring about the members of our company tell them that they are all well and none of them hurt. I will try to comply with your request about the use of tobacco. I have quit chewing and will try to quit smoking also. I do not use near as much tobacco as I used to. Last Monday was my birthday – July 7th – I was then 21 and on that day I made a resolve to quit chewing tobacco if possible and I have stuck to it since then and hope that I may continue to do so. It has been raining almost ever since yesterday morning, but our men have fixed up shelter to keep off the rain and are quite comfortably fixed. I have been very well except the diarrhea. I have been suffering with that for a short time but not enough to make me anyways sick. If you see Mrs. Woods tell her that her son is well and not hurt. He has written home since your letter was written. You need not believe any reports you hear about our company, for if the all reports that have been started about us in Richmond were so we would have all been dead long ago, although we have been in none of the real fighting. There is no news. Love to all. When you write direct your letters as heretofore. 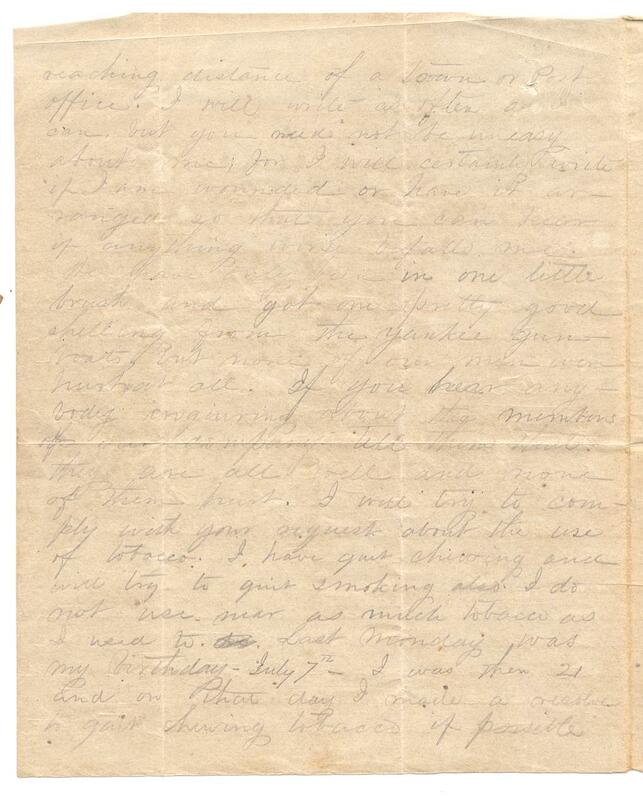 This entry was posted in Southern Historical Collection and tagged 27th North Carolina Infantry Regiment, diarrhea, Drury's Bluff, James Augustus Graham, Orange Guards, Petersburg, Prince George County Virginia, tobacco. Bookmark the permalink.